In going through the jumbled mass of pictures, press releases, artist sketches and tattered maps of the LAPD Parker Center Cop Shop Files, I found this photograph. And then a few more. And a few more. Was she a city official? A member of the Police Commission? Helen Kidder is a name you probably do not recognize – and you should. According to a biography in the 1997 book “Breaking and Entering” by Connie Fletcher, Kidder joined the LAPD in 1968, was assigned to the juvenile detail and the jail before moving to the criminal conspiracy section, where she spent 10 years, becoming the LAPD’s first female bomb technician. 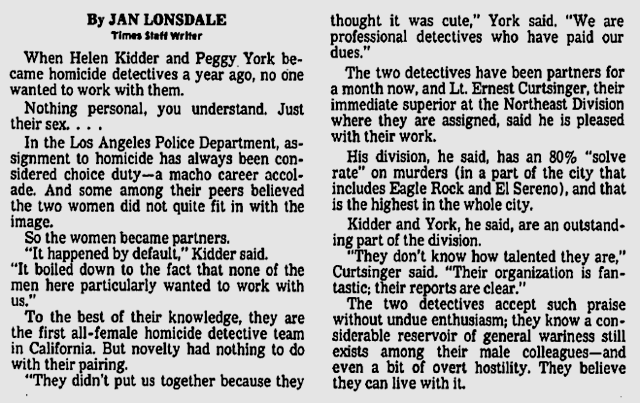 She also was one of the LAPD’s first two women to attend the FBI academy in Quantico, Va.
And in 1979, she was the LAPD’s first woman detective formally assigned to homicide, and she teamed up with Detective Peggy York because none of the men wanted to work with either of them. In 1981, Kidder and York were honored by the YWCA with a Silver Achievement Award and in 1982, they were interviewed by The Times’ Pulitzer Prize-winning TV critic Howard Rosenberg about the then-current TV show “Cagney & Lacey,” starring Tyne Daly as Detective Mary Beth Lacey and Meg Foster, who was replaced by Sharon Gless as Detective Chris Cagney. The show drew controversy after a TV Guide article quoted a CBS executive saying that the show was being retooled because the stars were viewed as “too harshly women’s lib” and “seemed more intent on fighting the system than doing police work. We perceived them as dykes.” (Welcome to the 1980s, young readers). A little background: In 1980, the LAPD was required by a consent decree to double the number of female officers and by 1983 put 10 times the number of women officers on patrol, according to a March 30, 1984, article by Marilyn Elias. In 1984, there were 6,500 male officers and 418 women, Elias wrote. By 1988, Kidder was a lieutenant in charge of the LAPD’s Employee Opportunity and Development Division and working on recruiting a more diverse workforce to meet with the consent decree. In 1989, a Times story notes that Kidder was with the criminal conspiracy unit. A 1996 article describes her as manager of security special services at the Getty Center. Another chapter in LAPD history from the Parker Center Cop Shop Files. This entry was posted in 1980, Film, Homicide, LAPD, Parker Center Cop Shop Files, Television. Bookmark the permalink. Very cool. Wonder what the disposition was for those murders in 1979… Did they ever conclusively link them? Seems like there was all kinds of terrible stuff happening to young women being found along the freeways back then. Santos: The Cop Shop Files are a time capsule of terrible crimes that occurred in L.A. from the late 1960s to the early 1980s, mostly during the Ed Davis administration. Stay tuned. They were the first murders attributed to the Sunset Strip Killers. These were the days of the Hillside Strangler and the Skid Row Slasher and several other colorful, long-running cases. I will probably get into them at some point in the Cop Shop Files. I would have guessed the young Wendy Hiller. Great article. I know Helen, and had the pleasure of working with her for a world-wide security company — I then moved on, and she then went to the Getty…..We’ve been in touch, although sporadically — she’s a real class act!!! Thanks for checking in. That was a really fun post to write! I knew Helen when she was CCS, worked with her and Arliegh McGree, both were great professionsals: .